Location: Frontera Wingshooting is situated in Cordoba province offering red deer hunts and wingshooting in Argentina. About your host at Frontera Wingshooting: Tomas Frontera, Founder. At Frontera Wingshooting we believe that one of the most important things in life is to enjoy ourselves and make each day count. We think that time well spent is that enjoyed with our friends and loved ones, doing the things we truly love and trying new, once-in-a-lifetime experiences. When starting his own hunting company, Tomas Frontera wanted to help fellow hunters do just that, live out their passion and share their experiences. 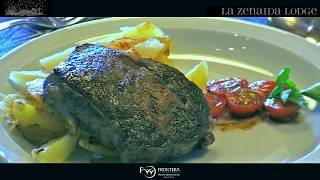 Tomas Frontera started Frontera Wingshooting in 2002 and one year later La Zenaida Lodge was built. He has not stopped growing since then. Frontera Wingshooting operates 4 hunting lodges offering the best wingshooting in the world with the greatest service and the most professional staff. Hunting experience at Frontera Wingshooting: Red Stag hunting in Patagonia is one the most exciting programs you will ever have. Hunting is carried out on foot in the steppes or on horseback when the method chosen is stalking through the woods surrounding the Andes, one of the most spectacular scenarios in the world. The rutting season is March to April. The steppe hunting takes place until late March. It is easier to identify this species once the rutting season has ended. Do not get the wrong idea: there are plenty of red deer in this area, since they do not need to live in the woods as one may imagine. They can also find their food and shelter in a seemingly deserted steppe, but it is in fact a very rich habitat, full of small hollows with high grasses that are appropriate for deer. Neuquén province is, undoubtedly, one of the best hunting areas. This area requires the hunters to be physically fit, as any other hunting area located near the mountains. Click here for quick link country guide. Frontera Wingshooting offers its own accommodation in its luxurious lodges. Click here to view your accommodation. To select and book the top suggested hotels and accommodation in the area when hunting at Frontera Wingshooting, click here. by car or public transport to Frontera Wingshooting. We had a great trime. The staff’s concern for the needs of each guest…the ambience of rural Argentina, the thoughtfullness in services and the sophistication…these reflect the vision and passion of Tomas Frontera. It was a good trip we had. Our trip was awesome. Everyone had a great time. Your staff is exemplary and met every need. Special accolades. It was good time. We had fun and trip was great. Thanks for a great trip! It was good to see all the Frontera staff! I love the office. Great time with the staff and at the place. Unbelievable experience! Everyone at La Zenaida was outstanding. Exceptional people, excellent food, and more birds than I’ve seen in my whole life. I’ll definitely be back! It was a good time. We had a great time!!! The entire staff was amazing. I cannot think of one thing that I would change. I hope we can come back in the near future. Great experience! !